Coverage: Races for the series will be featured live on the BBC Sport website, BBC iPlayer and BBC Red Button. Felipe Massa says Formula E could see a more competitive championship compared to Formula 1. Massa, who won 11 F1 grands prix, quit in 2017 after 15 seasons and has signed a three-year deal to race for Venturi in the all-electric series. "I think what makes things interesting in Formula E, and I really hope it happens with me, is that many drivers are able to win the race," he said. "Maybe many drivers can win the championship." The 37-year-old Brazilian added to BBC Sport: "I think it is a lot more closer compared to the cars in Formula E and cars in Formula 1." 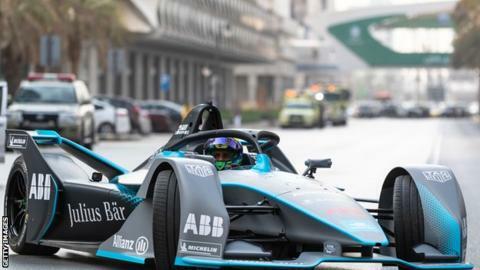 The opening race of Formula E season five takes place in Riyadh, Saudi Arabia on Saturday and is live on the BBC Sport website, Red Button and Connected TV from 12:00 GMT. Massa will be reunited with former Williams reserve driver Susie Wolff, who is the first female team principal in Formula E with Venturi. Stoffel Vandoorne - Fernando Alonso's team-mate at McLaren for the past two seasons - will race for HWA Racelab, while former Toro Rosso driver Jean-Eric Vergne is the reigning Formula E champion. Massa said he chose to join Formula E because it allows him to extend his career: "It is a championship I can race not only for one year and that's it," he said. "I can maybe race for a few years and still enjoy my career until I really decide to stop. I want to keep having fun like I have done all my life." There are 13 races in 12 cities including Paris, Rome and a double header in New York to close the season, from 15 December to 14 July 2019. Massa says he feels ready for the challenge of adapting to tighter street circuits and the new Gen2 car, which has double the energy storage capacity of the Gen1 model. "I'm racing this season and I don't know any tracks - except Monaco, half of the track I know," he added. "The understanding about all these batteries, how to use them in the perfect way - especially during the race - the way you need to save and charge them. Let's see how much I learn from the first race but I've already learned a lot from the first time I was in the car. "In testing everything went quite good I would say but now is when it counts."